At just 16, Kora Naughton, is proving herself as an artist with drive and determination. Recently crowded the 2017 Southern Stars Rising Star Female Artist at the Mildura Independent Country Music Festival has capped off a big year for Kora. In January she attended her first Tamworth Country Music Festival and decided that country music was what she wanted to do with her future. 2 years ago, doctors informed Kora - that she would have to give up her passion of cheerleading - due to a spinal cord condition, which resulted in two surgeries in 12 months. It was at this moment, Kora turned to music – teaching herself to play guitar, write songs and sing. Following Tamworth she applied and was accepted in the CMAA Junior Academy of Country Music. Kora’s first two singles - "Wrong" and "I Don't Wanna Grow Up" - both charted in various Top 10 Charts around Australia. Kora signed to Country Rocks Records in 2018 and will release her debut album in July 2018. 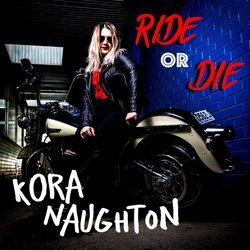 ‘Ride or Die’ is the brand new single from rising Australian star, Kora Naughton. It's edgy and cool and shows the youthful energy of this exceptional artist. “I wrote this song about taking chances, doing the things you’re afraid of and living life to the fullest”.